Whether you have decided to move your washer and dryer out to the garage or you were bequeathed your garage laundry room, there are ways to make it just a great as an indoor laundry room. Don't stay stuck in a dark, cold garage filled with car parts. Here's a quick guide to making your garage laundry room all it can be. As with really any home project, your first move should be a good deep cleaning. This is especially true for a room that will be used to clean. You'll thank yourself later! Clear the area you will be using for laundry of any other garage items, ie. tools, car care stuff, sporting equipment and toys and scrub down the walls and any shelving you already have in place. You will be much happier (well, as happy as you can be while doing laundry) in your space when it is free from clutter and dust. A great tip to keep your washer top from becoming a tool bench or a general catch-all is to simply put up a room divider screen or, if possible, a large window shade, really anything to create the feel of a separate space. Sometimes just breaking up the space is enough to deter intruders. It's amazing how some good organization can help make chores seem almost fun. If you don't have any already, you'll minimally need some shelving., a basic place to at least keep your laundry detergent out of the way. Ideally through, the more comfortable you make your laundry room the easier it will be to do the laundry. Adjustable wire shelving is actually great for a laundry room because it serves as both a conventional (waterproof) shelf and a drying rack of sorts. Another really nice thing to have nearby is a hanging rod. If you don't have the right set-up to install one, consider flipping a towel bar upside down and attaching it to the underside of a shelf. Also, if you're lucky enough, finding a clear spot for folding is always nice and can double as an ironing area when need be. Finally, there are two must haves in your garage laundry room: good lighting and a rug. A good overhead light will keep you from missing any of those sneaky stains, and a rug will make a cement floor bearable in colder temps! Typically, an uninsulated garage can get a bit uncomfortable at least for part of the year. It's a good idea to figure in where you'll keep either a space heater or a fan as your setting everything up, so that you can still function normally when the time comes to use it. For those of you who have cold winters, be sure your plumbing is well insulated. Frozen pipes and flooded garages make doing the laundry kind of difficult! But most importantly, be sure your dryer vents outside and your vents stay clean, you don't want a garage fire! 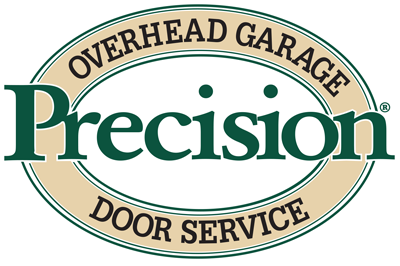 If a insulated garage door sounds like it could make doing your laundry a nicer experience, please don't hesitate to give one of our professionals here at Precision Door Service a call anytime!